Three mutations that block oogenesis, fs(2)B, fs(2)cup, and ovarian tumor (otu), also affect the development of NC chromosomes. Some of their alleles result in the formation of giant banded, polytene chromosomes (10-12). Fig. 2. Measurements of the DNA contents (expressed as multiples of the C value) of 151 sets of PNC chromosomes from an otu7/otu7 ovary. The right vertical axis shows the C values expected after 2-12 endomitotic cycles of DNA replication. 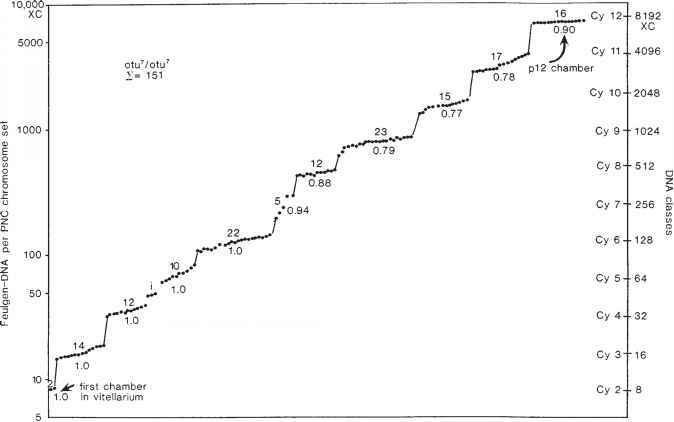 The numbers above each "step" show the number of estimates in each series. The decimals show the ratios between the medians for the series and the expected DNA values for the appropriate cycles. A cluster of three nuclei with DNA values intermediate between the cycle 4 and 5 series is labeled with an i (Reprinted with permission from ref. 23.). 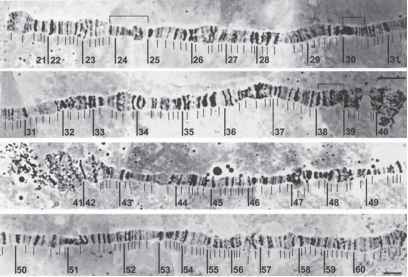 syncytia of certain mutants contain polytene chromosomes (11,13,17,19-22). The level of polytenization in NCs and PNCs of different otu mutants may vary in wide range from 128-512C to 1024C or even 2048-8192C (7,23). Oocytes of otu7 homozygotes are blocked at the p12 stage and die as dwarf, shelled eggs that lack glycogen-rich, beta yolk spheres (24). Eggs of otu11 homozygotes grow to an almost normal size and can be fertilized and laid. However, because the embryos die at an early stage, the defective eggs are called p14's to distinguish them from normal-stage 14's. The otu7/otu11 females are moderately fertile and otu11/otu14 females have excellent fertility. In the NC nuclei of otu7/otu7, homologs remain paired; they elongate slowly, and undergo replication cycles while remaining in register. During the first six endocycles, 100% of the DNA replicates; thereafter, only 80-90% replicates during each endocycle (see Fig. 2). During stages 10-p12, the NC undergo supernumerary DNA replications, and the polytene chromosomes that result reach DNA values of almost 8192C (23). We have studied otu7, otu11, and otu14, and their interallelic combinations and have found chromosomes from otu7/otu11, otu11/otu11, and otu11/otu14 to be of the best quality. The otu1 (formerly fs231) allele belongs to the ONC class. However, in combination withfs(2)B, PNCs with polytene chromosomes do occur (11). Photomaps of PNC polytene chromosomes made by Heino (22,25) were from females of genotype otu1/otu1; fs(2)B/+ reared at 18°C.